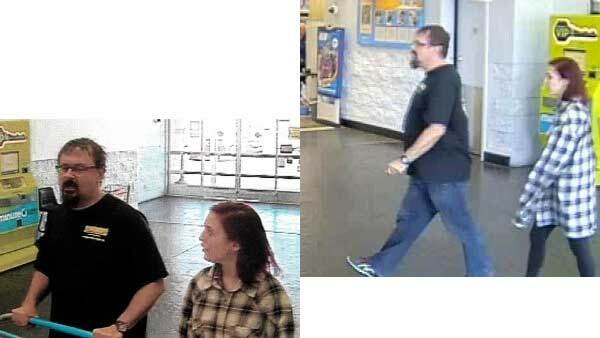 NASHVILLE, Tenn. -- The Tennessee teacher and 15-year-old girl who are the subject of a manhunt were spotted at a Walmart in Oklahoma City earlier this month, the first confirmed sighting of the two since officials say the teacher kidnapped the girl. Tad Cummins, 50, is suspected of abducting Elizabeth Thomas, his former student in Maury County, Tennessee, according to the Tennessee Bureau of Investigation (TBI). Thomas has been missing since March 13, weeks after a student reported she saw the pair kissing, police say. Surveillance images released Friday show Cummins and Thomas at a Walmart on East I-240 Service Road in Oklahoma City on the afternoon of March 15. There, Cummins used cash to purchase various food items, according to the TBI. The images show that Cummins has darkened his hair and that Thomas may have red hair now, the TBI said in a statement. Investigators are working to determine what vehicle they were using. Law enforcement officials believe Cummins is armed with two handguns and driving a silver Nissan Rogue with Tennessee plates. Cummins was added to the state's "Top 10 Most Wanted" list on Friday, TBI said.